How to make the icing bag. At last, what you can do if you believe Dr Perlmutter and his theory in his book Brain Maker. As I said at the beginning, there are critics, but, apart from the book itself, he doesn’t point you to buying proprietary brands of anything – instead giving some recipes to make! Let’s assume you want to make some change: that you want to encourage the correct balance of the bacteria that would be best for your body. How do you do it? Firstly, the message that has run throughout this book – go gluten free. Or, at the very least, cut your gluten intake to the minimum – gluten-lite. Secondly, Go low carb & embrace high-quality fats. Wherever possible eat organic, grass fed, free-range. Make sure you include plenty of leafy green vegetables, plus, mushrooms, onions ( and any in the onion family) ginger, parsley and water-chestnuts. Low-sugar fruits lemons, limes, and avocado, cucumber, tomato, courgettes, bell-peppers, aubergines. Eat Fermented Foods. Yoghurt, Pickled (fermented not in vinegar) fruits and vegetables: sauerkraut, kimchi, Fermented meat, fish or eggs. Healthy Fats: extra-virgin olive oils, sesame oil, flaxseed oil, coconut oil, grass-fed lard, pasture-fed butter, ghee, almond milk, avocado, coconut, olives, nuts, nut butter, cheeses (except blue cheese) and seeds. Protein: Whole eggs, wild fish, shellfish, molluscs, grass-fed meat, fowl, poultry, pork, wild game. Herbs, seasonings and condiments: mustard, horseradish, tapenade, and salsa – as long as they are free from gluten and sugar or soy. What all these have in common is that they are fibre-rich non-digestible (by us) though perfect for our gut bacteria to feast on. Fourthly, drink filtered water (Perlmutter believes that the chlorine added to the water supply to kill pathogenic bacteria – and thereby make the water safe – will also kill off our good bacteria) – so he recommends filtering the water to remove the chlorine before drinking. Sixthly, and lastly – Fast every season. At least four times a year – maybe on the equinox, fast for a day. Do drink water, but avoid caffeine. Permutter suggest you do this – a one day fast – before you start your change of life-style to one that cares for your gut-biome more. 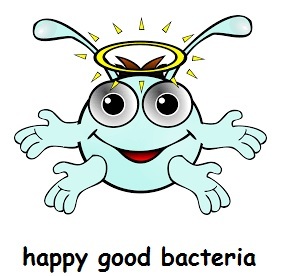 He also suggest you might like to take a one month course of probiotics (not telling you whose to buy) but listing the five core species of bacteria that need to be in them – and thereafter maintain these colonies and keep them thriving by eating the foods recommended above. But as you can see – you could do it the slower way – build up the bacteria required by adding fermented foods to your diet. He lists these on his website Here. or another list here. Fermented foods were, and are, used in all parts or the world, in all cultures at one time. In many these have been forgotten, overtaken by the quicker dousing in vinegar instead of an anaerobic fermentation that both preserves and grows a community of certain bacteria. The world of fermented foods, some only bacterial, some a symbiosis between yeasts and bacteria, is fascinating once you start and there is plenty of help to be found on the internet as interest in these old methods of preserving and keeping healthy grows. A last word on Vitamin D – a hormone really rather than a vitamin, made by your skin when in sufficient sunlight – is required for many of your body functions. When you realise that in the UK we do not have strong enough sun from October to May to make vitamin D we may all need a vitamin D boost (simple tablets) during those months. I continue my nutrition journey – and the more I read the more I believe we need to look back to how people ate before the industrialisation of food. Does this ring bells with you? Who put the butter in the jam? Hi Ann, this is very interesting, and thanks for doing the hard job of reading the book and then feeding us bite-sized, pre-digested info! Just a little post script about the “non-digestible” onion etc…another term for this I believe is “resistant starch” and one of the easiest ways to obtain this is from cooked, and then cooled potatoes. When cooked and eaten hot, then of course these are high carb which is not good, but after cooling, then the starch in them becomes ‘unavailable’ to us, but ideal food for our gut bacteria. So eating yesterday’s (hot) potatoes, cold today, is another way to feed our “gut good guys” 🙂 I think you wrote something about this before, wasn’t that with yesterday’s pasta in the same sort of way?? Thank you, and yes, you are correct about the potatoes, however Perlmutter did not have that listed, so I omitted it at this time. Thank you for the update! INVASION of the … LADYBIRDS!